The human thymus is required for establishment of the T cell pool in fetal life, but postnatal thymectomy does not lead to immunodeficiency in humans. Because thymectomy in humans is performed for treatment of myasthenia gravis (MG), we have studied patients with MG for effects of thymectomy on peripheral blood (PB) naive (CD45RA+, CD62L+) and memory (CD45RO+) T cells. We have also determined the effect of thymectomy on levels of PB cells containing signal joint TCR δ excision circles (TRECs), a molecular marker of thymus emigrants that have divided few times after leaving the thymus. In 17 nonthymectomized and 26 thymectomized MG patients studied at varying times after thymectomy (1 day to 41 years), we found no significant mean difference in PB T cell TREC levels between ages 40 and 80 years. However, both thymectomized and nonthymectomized MG patients had lower PB T cell TREC levels than did age-matched normal subjects (p < 0.0001 for both). These data demonstrated that MG itself or treatment for MG decreased thymopoiesis independent of thymectomy. Next, to control for disease activity and treatment, we prospectively studied 10 MG patients before and from 27 to 517 days after thymectomy. We found that thymectomy decreased CD4 or CD8 T cell TREC concentrations most when thymopoiesis was active before thymectomy (six of six patients), but had little effect in patients when thymopoiesis was minimal (four of four patients). In contrast, there was no significant effect of thymectomy on absolute numbers of naive PB T cells. Thus, in MG, removal of a thymus with active thymopoiesis resulted in a significant fall in PB TREC+ T cells postthymectomy. Defining the role of the human thymus in reconstituting the peripheral T cell pool is important in the setting of bone marrow transplantation, cancer chemotherapy, and AIDS (1). T cell reconstitution by the thymus has the advantage of regenerating complete T cell repertoires capable of responding to new Ag challenges. T cell reconstitution by peripheral T cell proliferation can be oligoclonal and can result in a T cell repertoire less able to respond to new Ags (2). The measurement of recent thymic emigrants (RTE)3 in humans has been hampered by lack of stable markers of newly produced T cells. Although expression of high m.w. isoforms of CD45 (CD45RA) has been useful in study of RTE in the setting of initial establishment of the peripheral T cell pool or in immune reconstitution (3), in adults a subset of CD45RA+CD62L+ T cells are memory T cells that have reverted from the memory (CD45RO+) phenotype (4). The use of an assay for signal joint (sj) TCR excision circles (TRECs) has allowed for analysis of T cells that have emigrated from the thymus and divided few enough times to retain TRECs, identifying these cells as either RTE or long-lived naive cells that have yet to divide in response to Ags (5). Myasthenia gravis (MG) is an autoimmune disease characterized by production of anti-acetylcholine receptor Abs, muscle weakness, and frequent clinical response to therapeutic thymectomy. MG is the only clinical setting in which therapeutic thymectomy is routinely performed. Therefore, we have used this clinical setting of therapeutic thymectomy to study the effect of thymus removal on human peripheral T cell pools in MG.
We found that thymectomy in MG resulted in a fall in peripheral blood (PB) TREC+ T cell concentrations when thymopoiesis was active at the time of surgery. In contrast, naive phenotype T cell levels did not fall after thymectomy, whereas memory phenotype T cell concentrations rose after thymectomy. PB samples were collected from 26 thymectomized and 17 nonthymectomized MG patients and from 37 normal aged-matched control subjects. An additional 10 MG patients were prospectively studied both before and from 27 to 517 days after thymectomy. All blood samples were obtained by venipuncture after informed consent in accordance with Duke University Institutional Review Board-approved protocols. Heparinized venous blood was processed for isolation of PBMC and CD4+ and CD8+ T cell subsets were isolated as described (5, 6). ETDA-treated blood was processed for flow cytometric analysis; automated white blood cell count and manual cell differential were obtained. Thymus tissue obtained from therapeutic thymectomy was used with informed consent according to Duke University Institutional Review Board-approved research protocols. Tissue was fixed in formalin and embedded in paraffin for immunohistological and light microscopic analysis or processed to provide thymocyte cell suspensions for analysis by direct immunofluorescence and flow cytometry (6, 7). MG was diagnosed based on clinical, electrophysiological and pharmacological criteria. The manual muscle test, a physician-applied scoring system of strength in sentinel muscles that are typically affected in MG, was performed at each clinic visit by a physician skilled in the evaluation of neuromuscular diseases. The quantitative MG score was also assessed at each clinic visit (8). Severity and distribution of MG before thymectomy was expressed using the severity classification of the Myasthenia Gravis Foundation of America (9). The clinical response to thymectomy was assessed using the Myasthenia Gravis Foundation of America Post-Intervention Status recently developed by the MG Task Force for Severity and Treatment Standards (9). The clinical characteristics of the MG patients studied before and after thymectomy are shown in Table I⇓. All patients were female with an age range of 14 to 61 years. Of 10 patients, 8 (patients 13, 29, 32, 49, 57, 58, 59, and 61) clinically improved during the first 2 mo after thymectomy (Table I⇓). During the time of study, four patients received prednisone, four received azathioprine, and two received mycophenolate mofetil. Duration of study after thymectomy ranged from 27 to 517 days. Three-color flow cytometric analysis was performed on a FACStarPlus flow cytometer (Becton Dickinson, San Jose, CA) using FITC, PE, and PE CyChrome 5 (PC5) as the fluorescent parameters. Directly conjugated mouse anti-human mAbs were used: CD3-FITC; CD4-PC5; CD8-PC5; CD45RA-PE; CD45RO-PE; Ki-67-FITC; and CD62L-FITC (Beckman-Coulter, Miami, FL). Saturating amounts of Ab (per manufacturer’s protocol) and 100 μl EDTA anticoagulated whole blood was added directly to each tube. The mixture was incubated in the dark at room temperature for 10 min. RBC were lysed with an automated Coulter TQ Prep sample processor (Beckman-Coulter). Samples were washed with 3 ml PBS wash (1× PBS, 1% BSA, 0.1% NaN3) and resuspended in 1 ml PBS wash with 0.4% paraformaldehyde. For each sample, forward and side angle light scatter profiles were used to acquire 5,000 events representing viable lymphocytes. Data were saved and analyzed with CellQuest software (Becton Dickinson). Intracellular expression of Ki-67 was determined in cryopreserved PBMC samples from the prospective study. Cells were thawed, washed in PBS wash, and stained for surface CD45RO and CD4 or CD8 as above. Samples were then washed and fixed with FACS permeabilizing solution (Becton Dickinson), incubated with saturating amounts of anti-Ki-67-FITC (Beckman-Coulter) (30 min), and then washed and resuspended in 1 ml PBS wash with 0.4% paraformaldehyde. Thymocyte single-cell suspensions were stained with saturating amounts of CD3-FITC, CD4-PE, and CD8-PC5 (Beckman-Coulter) for three-color flow cytometric analysis. The percent CD4/CD8 double-positive (DP) was used to determine the degree of thymopoiesis (patients 13, 29, 32, 49, 50, 57, 58, 59, and 61). Thymocytes were unavailable for patient 36; therefore, the degree of thymopoiesis was determined by the percent CD1a+ staining in formalin-fixed tissue sections (see below) (6). Genomic DNA from unfractionated PBMC was extracted using TRIzol (Life Technologies, Gaithersburg, MD). Quantitative competitive PCR was performed as previously described (10). Briefly, dilutions (5000, 1000, 500, and 100 molecules) of sjTREC standard were simultaneously amplified with 1 μg sample genomic DNA. Sample and standard bands were imaged and analyzed using a PhosphorImager and ImageQuant software (Molecular Dynamics, Sunnyvale, CA). Molecules of sample TREC were determined as previously described. Where indicated, the number of molecules of TREC in unfractionated PBMC sample was corrected for the number of T cells in each sample using the percent CD3+ cells from the flow cytometric phenotype (lymphocyte gate) and the percent lymphocytes in the PBMC preparation. Quantification of TREC in isolated CD4+ and CD8+ T cells was performed by real time quantitative PCR using the 5′-nuclease (TaqMan) assay with an ABI7700 system (Perkin-Elmer, Norwalk, CT). PBMC were separated into CD4+ and CD8+ populations using MACS magnetic microbeads (Miltenyi-Biotech, Auburn, CA). Cells were lysed in 100 μg/ml proteinase K (Boehringer Mannheim, Indianapolis, IN) for 1 h at 56°C, then 10 min at 95°C, at 107 cells/ml. Real time quantitative-PCR was performed on 5 μl of cell lysate (equivalent to 50,000 cells) with the primers cacatccctttcaaccatgct and gccagctgcagggtttagg and probe FAM-acacctctggtttttgtaaaggtgcccact-TAMRA (MegaBases, Chicago, IL). PCR contained 0.5 U platinum Taq polymerase (Life Technologies), 3.5 mM MgCl2, 0.2 mM dNTPs, 500 nM each primer, 150 nM probe, and Blue-636 reference dye (MegaBases). Conditions were 95°C for 5 min, then 40 cycles 95°C for 30 s, and 60°C for 1 min. A standard curve was plotted and TREC values for samples calculated by ABI7700 software. Samples were analyzed in duplicate. Molecules of TRECs were determined in cell lysates equivalent to 50,000 cells. The number of molecules of TRECs was then doubled to reflect the number of molecules in 100,000 cells. We made the assumption that there are at most 2 TRECs per cell and predicted the number of possible TREC+ cells in a sample based on the number of molecules of TRECs. The following mAb reagents were used in this study: anti-cytokeratin (AE1/AE3 from Boehringer Mannheim plus CAM5.2 from Becton Dickinson), CD1a mAb 010 (gift from A. Bernard, Institut National de la Santé et de la Recherche Medicalé, Creteil, France), and mAb mib-1 against Ki-67 (11). Isotype-matched control mAbs were obtained from Sigma (St. Louis, MO). Immunohistochemical staining was performed on 4-μm formalin-fixed paraffin-embedded thymus sections as described (12). Both descriptive and analytical statistical methods were used to analyze the data. Descriptive methods consisted of means, SDs, correlations, medians, and other selected percentiles. Analytical methods consisted of the two-sample t test, univariate regression analyses, and repeated measures regression analyses. Traditional univariate linear regression analyses were used for assessing the relationship between TRECs and age. The general linear mixed model (13) was used for the 10 subjects with repeated measurements studied prospectively. All statistical tests used a two-sided level of significance of 0.05 (α = 0.05). For assessing the relationship between TRECs and age, an initial linear regression model representing separate intercepts and slopes for each of the three treatment groups were fit, using age centered at 52 years. The model results showed no significant differences in slopes between the groups. A reduced model was fit representing equal slopes (assumption of parallel lines) and different intercepts (analysis of covariance). Cited p values and interpretation for assessing the relationship between TRECs and age are derived from the analysis of covariance. The general linear mixed model is a multivariate regression method that helps to generalize the ANOVA and general linear regression methods to longitudinal (repeated measures) data. The mixed model is a statistical method for modeling longitudinal continuous outcome measures as a function of fixed (population) effects while simultaneously modeling individual subject parameters as random effects. The mixed model can accommodate both time-dependent covariates and static covariates. In the prospective study, each mixed model analysis included the outcome variable of interest. Time after treatment (days) and intercept were used as fixed effects. Only intercept was used as a random effect. Cited p values and interpretation for assessing relationships in the prospective study were derived from the mixed model analyses. First, in cross-sectional analysis, we studied 37 aged-matched normals, 17 nonthymectomized MG, and 26 thymectomized MG patients for PB T cell subset concentrations and for T cell TREC concentrations. MG patients were studied at an average of 9.4 years after thymectomy (range, 0.5 to 41 years). We found that compared with nonthymectomized MG patients and to control subjects, this group of thymectomized MG patients over time had neither lower total PB T cells (Fig. 1⇓A) nor lower naive (Fig. 1⇓, B and C) nor memory PB T cell concentrations (Fig. 1⇓, D and E). 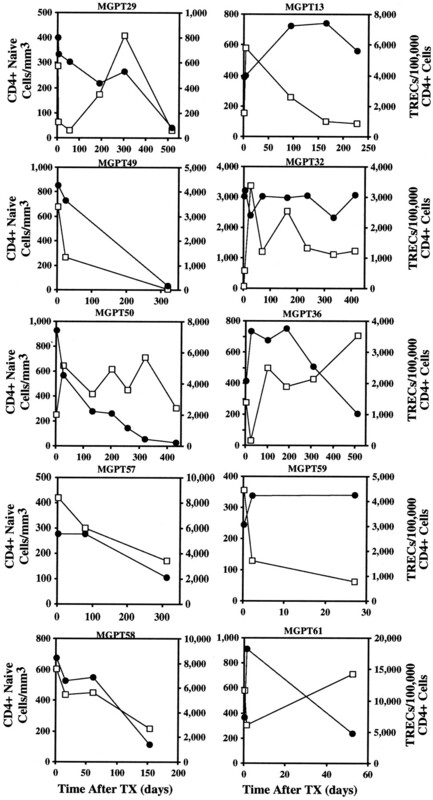 Total T cell, CD4+, and CD8+ naive and CD4+ and CD8+ memory phenotype T cell levels in normal controls, nonthymectomized MG patients, and thymectomized MG patients. Thirty-seven normal subjects (□), 17 nonthymectomized MG patients (▪), and 20 thymectomized MG patients (▧) were studied for the absolute number of T cell subsets. Naive T cells were CD4+CD45RA+CD62L+ or CD8+CD45RA+CD62L+ T cells, whereas memory T cells were CD4+CD45RO+ or CD8+CD45RO+ T cells. Next, we determined PB T cell TREC concentrations in this cohort of normals and nonthymectomized vs thymectomized MG patients. We found that both thymectomized and nonthymectomized MG patients had significantly lower mean PB T cell TRECs than aged-matched normals (p < 0.0001 for both) (Fig. 2⇓), an observation compatible with our previous observation of accelerated thymic atrophy in MG (1, 12). However, when nonthymectomized MG patient T cell TREC levels were compared with thymectomized MG patient T cell TREC concentrations, there was no significant difference. Thus, either immunosuppressant therapy, the autoimmune disease process, or both, contributed to lower PB TREC concentrations in the cross-sectional cohort of patients, likely obscuring any observation of effect of thymectomy on TRECs in MG patients. sjTRECs per 100,000 T cells in normal subjects (n = 32; •), nonthymectomized MG patients (n = 14; ○), and thymectomized MG (n = 33; ▵). Both thymectomized and nonthymectomized MG patient TREC concentrations were significantly lower than those of controls (p < 0.0001 and p < 0.0001, respectively). However, there was no significant difference between thymectomized and nonthymectomized TREC concentrations. To directly assess both thymus function and effects of thymectomy on peripheral T cell pools over the short term in MG and to carefully monitor MG disease activity and therapy during the study, we next studied 10 MG patients before and after thymectomy for changes in PB T cell subsets. Repeated measurements were collected on each subject, ranging from a minimum of three observations to a maximum of eight observations. Fig. 3⇓ shows the effect of thymectomy on numbers of PB TREC+ cells per 100,000 CD4+ T cells (•) and absolute numbers of CD4+, CD45RA+, CD62L+ (CD4+ naive) T cells (○). After thymectomy, TRECs/100,000 CD4+ T cells fell in 6 of 10 MG patients (patients 29, 49, 50, 57, 58, and 61). In one additional patient (patient 36), TREC+CD4+ T cells rose and then fell to slightly below prethymectomy levels on day 510. 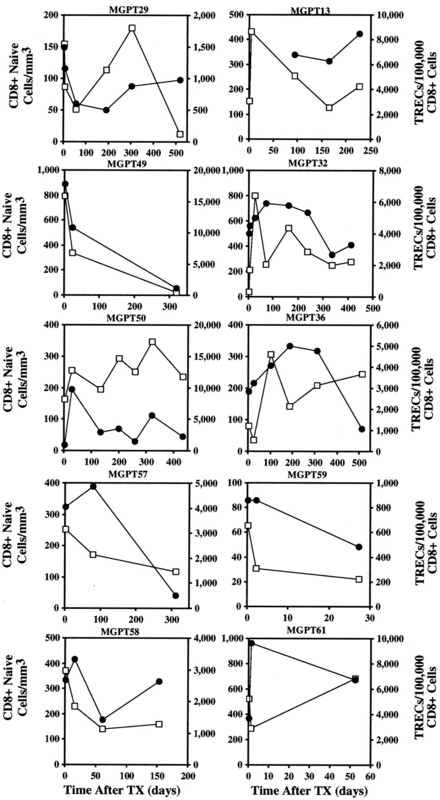 Similar patterns were seen for TRECs/100,000 CD8+ T cells (Fig. 4⇓). In contrast, the absolute number of naive phenotype CD4+ T cells was more variable and often rose at the time of fall in TRECs/100,000 CD4 T cells. Effect of thymectomy on absolute numbers of CD4+ naive T cells (□) and on TRECs per 100,000 CD4+ T cells (•). In patients 29, 49, 50, 57, 58 and 61 TRECs per 100,000 CD4+ T cells fell after thymectomy; whereas in patients 13, 32, 36, and 59, TRECs did not fall. The scale of each axis varies among patients. Effect of thymectomy on absolute numbers of CD8+ naive T cells (□) and on TRECs per 100,000 CD8+ T cells (•). Patients are arranged as in Fig. 3⇑. The scale of each axis varies among patients. The oscillating changes in lymphocyte absolute numbers in human peripheral blood (see patient 50 in Fig. 3⇑) are due to shifts of T cells from peripheral tissues to blood (20). This apparent contradiction with data shown in Fig. 3⇑ demonstrating simultaneous fall in CD4+TREC+ T cell concentrations can be resolved by appreciating that TRECs/100,000 CD4+ T cells is a measurement of the relative proportion of TRECs in the CD4+ T cell pool. Because this measurement is independent of the absolute number of CD4+ T cells per mm3 of blood, it is not affected by changes in the absolute CD4+ T cell count per mm3. Thus, when TRECs/100,000 CD4+ T cells fall, the overall percentage of TREC+ T cells falls in PB. Assuming that TREC+ and TREC− T cells leave the circulation in equal proportions, TRECs per 100,000 cells is a better measurement of thymic output because TRECs per 100,000 cells is independent of the absolute lymphocyte count (which is highly variable). To analyze the status of the thymus in patients in whom TRECs/100,000 cells fell after thymectomy, we next studied the thymus tissue that was removed from the 10 patients for degree of thymopoiesis at the time of thymectomy. We have previously shown that the human postnatal thymus is a chimeric organ comprised of central (thymocytes in the thymic epithelial space) and peripheral (T cells from the periphery in the thymic perivascular space) components (12, 14). The percentage of the areas within adult thymuses with ongoing thymopoiesis, as measured by percent thymic epithelial space (1, 12), decreases with age (1, 15, 16). Moreover, patients with MG have accelerated thymic atrophy (1, 12), and the “hyperplastic” MG thymus actually represents exuberant peripheral T and B cells in the thymic perivascular space. The true epithelial space of many MG thymuses is actually “hypoplastic” with few CD4/CD8 DP, CD1a+ developing cortical thymocytes (12, 17). To determine whether the degree of thymopoiesis present in the MG thymus at the time of thymectomy played any role in determining the PB TREC+ T cell response to thymectomy, we determined the level of thymopoiesis in thymuses from patients in whom TRECs per 100,000 cells decreased after thymectomy and in patients in whom TRECs did not decrease after thymectomy (Table II⇓). We found that the thymuses of six of six patients in whom TRECs per 100,000 cells fell after thymectomy contained large areas of active thymopoiesis, (mean 68 ± 9% cortical thymocytes). In contrast, four of four thymuses from those in whom TRECs per 100,000 did not fall after thymectomy had primarily areas of perivascular space lymphocytes surrounding epithelial spaces largely devoid of developing thymocytes (mean of 7 ± 9% cortical thymocytes, p < 0.0001) (Fig. 5⇓). Thus, the morphology of the thymus correlated with postthymectomy fall in TREC+CD4+ and CD8+ T cells. 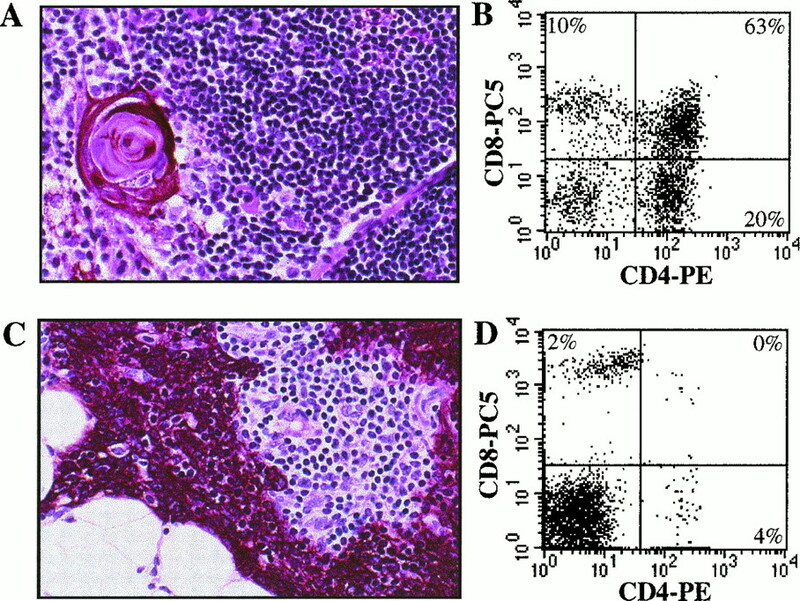 Thymus morphology and analysis of thymocyte subsets in patient 50 (A and B) in whom TRECs per 100,000 CD4+ T cells fell compared with patient 32 (C and D) in whom TRECs per 100,000 CD4+ and CD8+ cells did not fall. A, Normal thymic cortex and medulla (patient 50) in immunohistology reacted with anti-keratin Ab (brown). ×200. B, Flow cytometry dot plot of CD4 and CD8 expression. The dot plot shows normal percentages of CD4 single-positive, CD8 single-positive, DP, and double-negative thymocyte subsets. In contrast, patient 32 had no thymopoiesis by immunohistology with condensed epithelium devoid of thymocytes (C) (×200) and 0% DP thymocytes (D). We performed mixed model analyses on serial determinations of absolute numbers of CD4+ and CD8+, TREC+ T cells/mm3 of blood and absolute number of CD4+ or CD8+ naive (CD45RA+, CD62L+) cells. Slopes of change in cell levels were determined and used to estimate the total gain or loss of each subset per day after thymectomy in those patients with active thymopoiesis before thymectomy (Table III⇓) (13). Total blood volume was assumed to be 5000 ml for each patient. TRECs per 100,000 CD4 T cells significantly fell with a slope of −6.5094 (p = 0.0075) as did TRECs per 100,000 CD8 T cells (slope −5.9460, p = 0.0308). When calculated per total blood volume, the absolute number of CD4 and CD8 TREC+ T cells fell ∼180,000–190,000 per day after thymectomy (Table III⇓). In contrast, naive phenotype CD4 or CD8 T cells did not fall after thymectomy (Table III⇓). When the 10 MG patients followed longitudinally were analyzed with the mixed model, significant rises in CD8+, CD45RO+ memory phenotype T cells were seen postthymectomy (p = 0.0019) (Table IV⇓), whereas rises in CD4 memory phenotype cells just missed statistical significance (p = 0.074). CD4 memory T cells rose postthymectomy in the intravascular space at a rate of 3.26 million cells/day, whereas CD8 memory T cells rose at a rate of 1.64 million cells/day. Thus, the short term effect of thymectomy on memory phenotype T cells in MG resulted in significant rises in absolute numbers of PB CD8+ memory T cells. The rises in CD4+ and CD8+ memory T cells that occurred postthymectomy could be due to 1) redistribution of T cells into the blood from extravascular sites, 2) increase in proliferative rate of peripheral T cells with expansion of the peripheral T cell pool, or 3) decrease in T cell apoptosis with increase in circulating half-life of peripheral T cells. Although a full analysis of these issues is beyond the scope of this current study, an analysis of naive and memory T cell proliferative rates could be useful in suggesting which processes might be ongoing after thymectomy. Thus, we determined the percentage of CD4+ and CD8+, memory (CD45RO+) T cells that were proliferating (i.e., were Ki-67+ and had left the G0 stage of the cell cycle) both before and after thymectomy (Fig. 6⇓) (18). We found no significant effect of thymectomy on the percentage of Ki-67+CD4+ and CD8+, memory PB T cells. 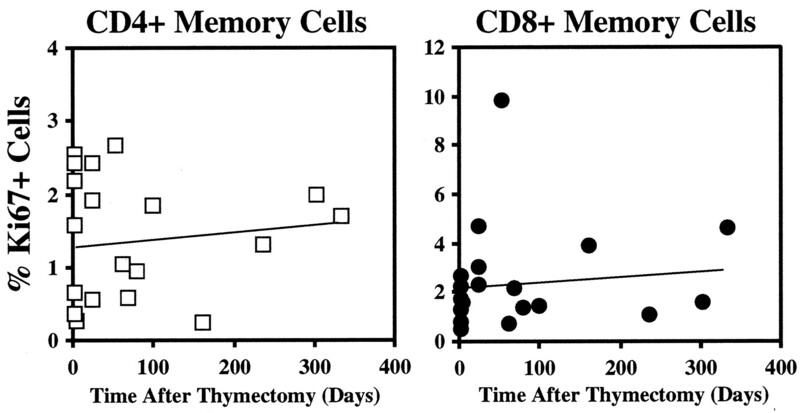 Frequency of Ki-67+, CD4+, or CD8+ memory T cells before and after thymectomy. The percent Ki-67+ CD4 or CD8 memory T cells before (time = 0) and after thymectomy was determined on PB CD45RO+ T cells by flow cytometry. There was no significant change in Ki-67+, CD4+, or CD8+ T cells when before and after thymectomy values were compared (p = NS). Fauci et al. (19) have shown in humans that 4 h after oral or parenteral corticosteroids, T cells leave the circulation and return by 24 h after each daily corticosteroid dose. Immunosuppressive drugs such as azathioprine can inhibit lymphopoiesis (20, 21). Thus, it is critical in our study to carefully analyze our data for confounding effects of corticosteroid and immunosuppressive therapy. Patients 13, 29, 32, and 59 had received prednisone at some point in time during our study, and patients 13, 29, 32, and 50 were on azathioprine or mycophenolate mofetil immunosuppressive therapy (Table I⇑). Given that lymphocyte levels return to baseline 24 h after each prednisone dose (19), in each instance when possible, we drew blood before the morning dose of corticosteroids. In those instances in which the clinical situation mandated that blood be drawn after the dose of corticosteroids or immunosuppressive agent, we studied the effect of corticosteroid administration on PB TREC+ and TREC− cell levels. We found that neither prednisone nor immunosuppressive drugs affected TREC+, CD4+ T cell levels per 100,000 T cells. This is best seen in Fig. 3⇑ in patients 29, 13, and 32. Patient 29 began prednisone and azathioprine 6 wk after thymectomy and showed a continued slow decrease in TRECs that had begun before prednisone and azathioprine, despite wide swings postthymectomy in total CD4+ naïve phenotype T cell count. Patient 13 had blood drawn prethymectomy 4 h after prednisone and had a naive CD4 cell count of 159/mm3 and TRECs of 3,933/100,000 CD4+ T cells. Three days postthymectomy, she did not receive any steroids for 48 h, and the naive CD4+ T cell concentration was 581/mm3 and a TREC concentration of 4,037/100,000 CD4+ T cells. Thus, although absolute naive T cell levels were affected by corticosteroids in patient 13, TRECs per 100,000 CD4+ T cells were not affected; i.e., compared with TREC-negative T cells, TREC+ T cells were neither preferentially kept in the intravascular space nor preferentially removed from the intravascular space by corticosteroids. Rather, TREC+ and TREC−CD4+ T cell trafficking was equally affected by steroids; thus, before and after steroids, the relative proportions of TREC+ to total CD4+ T cells were the same (Fig. 3⇑, top right). This point is also relevant to the observation above that TRECs/100,000 CD4 or CD8 T cells is a better reflection of thymic output than absolute numbers of naive phenotype cells. Our data with steroids support the assumption that TREC+ and TREC− T cells equally enter and leave the peripheral circulation, confirming that the measurement of TRECs per 100,000 cells is independent of absolute lymphocyte and T cell numbers. Patient 32 also received prednisone and azathioprine or mycophenolate mofetil throughout the study, and Fig. 3⇑ shows constant TRECs per 100,000 CD4+ T cell concentrations throughout the study despite fluctuations in absolute CD4+ naive T cell levels. Similarly, patient 59 was also on azathioprine and prednisone throughout the course of the study and showed slow rises in relative TREC levels, even in the face of low absolute CD4+ naive cell levels (Fig. 3⇑). Patients 13, 32, and 59 were all receiving prednisone and/or azathioprine at the time of thymectomy and had a mean ± SEM of 7 ± 5% DP thymocytes compared with 68 ± 9% DP thymocytes (p < 0.0001) in thymuses of the remainder of the group which were not on corticosteroids or immunosuppressive drugs at the time of thymectomy. Thus, in these three patients who received corticosteroids prethymectomy, the lack of fall in TRECs per 100,000 CD4+ or CD8+ T cells after thymectomy was associated with corticosteroid treatment prethymectomy. Finally, the observation that thymectomy was able to significantly raise CD8+ memory phenotype T cell levels (Table IV⇑) in the face of the T lymphopenic effect of corticosteroids (19) argues for a true biological effect of thymectomy on memory PB T cell levels. In this study, we have determined the effect of thymectomy on PB naive and memory phenotype T cell levels, and on TREC+ T cells, both in a short term prospective study, and in a cross-sectional study of 43 MG patients. In the prospective study, we found that thymectomy led to a significant fall in TREC+, CD4+, and CD8+ T cells after thymectomy. Fall in CD4 and CD8 T cell TREC concentrations were most pronounced in 6 of 10 patients, all 6 of whom had active thymopoiesis at the time of thymectomy. In the four patients in whom TREC fall was less dramatic or did not occur, thymopoiesis was minimal as determined by the percent of DP cortical thymocytes at the time of thymectomy. In the cross-sectional study, TRECs were decreased in thymectomized MG patients compared with normal controls (p < 0.0001). However, nonthymectomized MG patients also had decreased PB TREC levels compared with normals (p < 0.0001). When thymectomized MG patients were compared with nonthymectomized MG patients, there was no significant difference in TRECs per 100,000 T cells. Taken together, these data demonstrated accelerated thymic atrophy in MG patients that confounded the analysis of effect of thymectomy on TREC levels in the cross-sectional study. In contrast, in the prospective study in which immunosuppressive drug therapy and disease activity were carefully monitored, we observed that thymectomy resulted in loss of CD4+ and CD8+TREC+ T cells and rises in memory PB CD8+ T cells. Gerli et al. (22) have reported that thymectomy in MG resulted in slightly decreased T cell levels (mean of 12 years after thymectomy), whereas recently thymectomized MG patients (mean of 4 mo after thymectomy) had normal T cell levels. Ramos et al. (23) studied children thymectomized for corrective cardiovascular surgery either before or after age 1 year and found that when thymectomized before age 1 year, a mild T cell lymphopenia was seen 8 years after follow-up, but when thymectomized after 1 year of age, thymectomy had no effect on peripheral T cell levels. In 1983, in a prospective study of 11 MG patients, we similarly found that thymectomy did not decrease CD4+ or CD8+ T cell levels but rather raised CD4+ and CD8+ T cell levels, particularly in older subjects (21). Our present study confirms these latter findings and shows that this suppressive effect of the adult thymus on PB T cells numbers is primarily on memory T cells. We have also previously reported that compared with normals, thymectomized MG patients had decreased CD4+ and CD8+TREC+ T cells, but in that study, a nonthymectomized MG patient control group was not included (5). We have previously shown accelerated thymic atrophy in MG patients after age 40 years (1, 12). 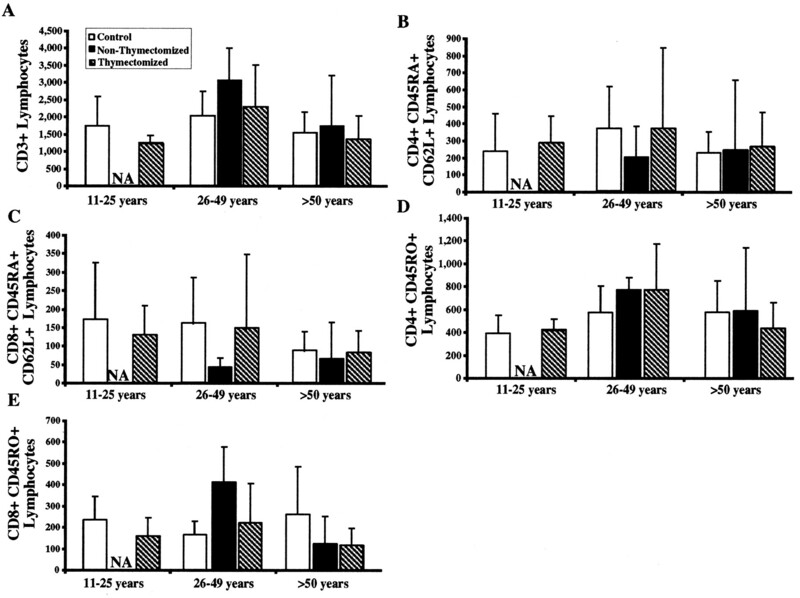 All nonthymectomized MG patients were between ages 40 and 80 years and likely had advanced thymic atrophy compared with age-matched controls. Thus, accelerated thymic atrophy in MG, whether associated with immunosuppressive treatment, thymic infiltration with peripheral immune cells, or both, likely hindered the observation of the effects of thymectomy on TREC+ T cells in the cross-sectional study. However, clear-cut decrease in TRECs were seen over time in MG patients followed prospectively after thymectomy. Although our prospective study represents a small sample size in both the number of subjects studied and the number of repeated measurements obtained, a consistent fall in CD4 and CD8 TREC concentrations were seen in those patients with active thymopoiesis. Patients with MG who undergo thymectomy are frequently treated with immunomodulating agents such as corticosteroids and/or azathioprine. We controlled for this factor by drawing blood 24 h after corticosteroid administration or by taking the use of these drugs into account when analyzing the data. Immunomodulating medications are an unavoidable complication of this study in that it would not be ethical to withhold medication before thymectomy. After thymectomy, as many as 10–15% MG patients may have residual thymus tissue due to ectopic thymus tissue in the neck that may not be excised during total thymectomy (24). However, we saw decreases in TREC level per 100,000 CD4+ T cells in each patient with active thymopoiesis at the time of thymectomy. Also, the lack of effect of thymectomy on naive phenotype T cell levels, in most of the patients studied, most likely relates to thymectomy-induced prolongation of naive T cell half-life. A similar effect was seen in mice that preserves naive T cell levels after thymectomy (25). The observation that thymectomy raises memory T cell concentrations is an interesting phenomenon and at first glance seems most likely to be related in some way to plasma corticosteroid levels. However, to date, we have found no significant increase in corticosteroid levels prethymectomy (Ref. 21 ; data not shown), although it is possible that we have not assayed at the peak time of corticosteroid production (i.e., early morning). Because the biological effects of steroid occur several hours after steroid signaling, the effect of steroids on any given concentration of blood lymphocytes could be the result of a plasma steroid concentration of several hours earlier. Mackall et al. (26) have shown a suppressive effect of the presence of murine thymus on peripheral T cell expansion. We have shown that leukemia-inhibitory factor (LIF) and oncostatin M (OSM) both are produced in adult thymus, and mRNA concentrations of these cytokines increase with age (14). We have also shown that administration of LIF and OSM to mice induced PB T cell depletion and increased plasma corticosteroid levels (G. D. Sempowski and B. F. Haynes, unpublished observations). Although we have yet to directly demonstrate elevated corticosteroid concentrations prethymectomy that fall postthymectomy, these observations raise the hypothesis that the thymus is an endocrine organ, producing factors/cytokines such as LIF and OSM that may play roles in modulating PB T cell levels. Alternatively, the aging thymus may be producing as yet undescribed inhibitors of peripheral T cell trophic factors that inhibit the effects of cytokines such as IL-2 and IL-7. Finally, an additional explanation for the lack of fall of T cell TRECs after thymectomy in certain patients is the possibility that TREC+ T cells could be generated extrathymically. Against this possibility in humans is the report that no TREC+ T cells could be measured in patients with DiGeorge syndrome until thymopoiesis was therapeutically initiated via a thymus transplant (27). The observation that naive phenotype T cells did not fall after thymectomy could also indicate an extrathymic source for CD45RA+ T cells. However, Heitger et al. (28) showed that when a previously thymectomized patient was irradiated before bone marrow transplantation, no CD4+, CD45RA+ naive T cells regenerated and only CD45RO+ memory T cells engrafted, demonstrating the thymus dependence of the CD4+, CD45RA+ naive T cell generation. We showed in thymectomized AIDS patients who were not irradiated that a long-lived CD4+CD45RA+CD62L+TREC− population of T cells was present that rose after highly active antiretroviral therapy due to redistribution of T cells from the periphery to blood (6). Thus, CD4+CD45RA+ T cells are required to be produced in the thymus, and in the absence of ablative therapy, after thymectomy CD4+CD45RA+CD62L+ human T cells persist for long periods of time (Ref. 6 ; this study). Future studies will be targeted at direct analysis of the effect of thymectomy on PB naive and memory T cell half-lives and proliferation rates. The recent development of safe techniques to directly measure T cell half-lives using [6,6-2H2]glucose infusions now makes these studies possible (29, 30). We thank Brenna J. Hill and Joeseph M. Horvatinovich for expert technical assistance, Kim R. McClammy for secretarial assistance, and Bernadette Tucker-Lipscomb for assistance in patient blood sample procurement. ↵1 R.A.K. is an Elizabeth Glaser Scientist of the Pediatric AIDS Foundation. ↵3 Abbreviations used in this paper: RTE, recent thymic emigrants; sj, signal joint; TREC, TCR excision circle; MG, myasthenia gravis; PB, peripheral blood; DP, double-positive; LIF, leukemia-inhibitory factor; OSM, oncostatin M.
Fauci, A. S., B. F. Haynes, and P. Katz. 1980. Drug-induced, T, and B lymphocyte dysfunction. In Infection Complicating the Abnormal Host. M. Grieco, ed. Yorke Medical Books, New York, pp. 163–182.